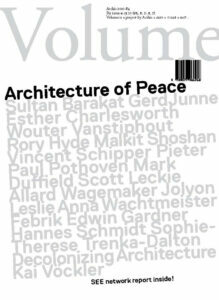 How do we materialize peace? On the level of fundamental and basic needs, global society more or less knows what is wrong, and what to do about it. There is a wealth of knowledge and experience in relief and first aid organizations, as there is with architects. We’re ready to intervene in conflict areas, to fight for peace, but what are we to do next? Experts seem agreed on strategies, but are the architects and politicians ready for the long-haul?